Having decided to do the Rally, we needed a vehicle. It had to be under 1000cc and as cheap as possible, so when we were told that there was a 602cc Citroen Dyane in a shed on a farm that we could have for free we were cautiously optimistic. We went to the farm, swept the mounds of crap away and found underneath a rather sorry looking machine- it had no roof, the interior was destroyed, and squirrels had moved in to the engine bay. However, the chassis was good, and our attempt to turn the engine over revealed that it wasn’t totally seized. So, several months, a partial engine rebuild, a whole lot of welding and 2 MOTs later we finally got the beast on the road. The Citroen was always very spartan- no reversing light, no fog light, and the seats, whilst quite comfortable, were on the edge of collapse. So, we crammed some old lawn chair cushions into the seats, and then added every light we could possibly imagine needing- thanks to HC Cargo, who supplied all the various switches and relays. At this point we had a car- but not a rally car. So, we added some weapons grade LED spot lamps from Lazer Lamps, a bootrack for our jerry cans and cooking kit, and a compressor from Matt Savage. We had been told that the appalling roads would give us near constant punctures, so we went prepared to change our tyres anywhere. Whilst the original Michelin X tyres had been good enough to get the car through its MOT, we decided we should definitely have a full set of fresh ones before heading out. After speaking to Dougal and his team at Longstone Tyres, we settled on a set of the original 125x15 Michelin X. So, with these installed, and our inoculations, visas and various other paperwork all lined up we were ready to leave. At this point, the car had already far exceeded the expectations of just about everyone involved- it was only as we drove onto the ferry at Dover that the realisation really set in. All across Europe, to the launch party in Prague, through Slovakia, Hungary, Romania and Bulgaria, we had very little trouble- there was the odd oil leak etc and our brakes, in need of adjustment, overheated several times. However, there was nothing that couldn’t be fixed. It was in Turkey that we had our first real breakdown- our alternator belt went. We were going down the motorway and suddenly realised that our horn wasn’t working any more. Initially we assumed it was a fuse, however when the lights stopped working, we decided to pull over for a look. When we popped the bonnet, we found a pile of black dust around the alternator- we pulled the remains of the belt out, fitted the spare and after a very sketchy roadside bumpstart we were back on the road. The car then performed fine right through Georgia, an amazing country with terrible driving, and Azerbaijan, which was quite similar in that respect. 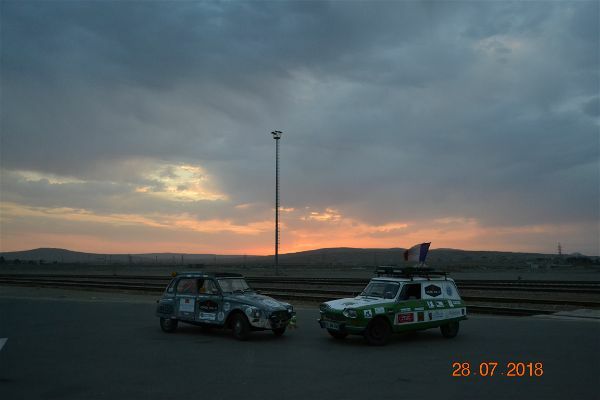 We arrived at Baku, the port for the Caspian Sea ferry, and then we waited. Initially expecting to spend a day at most waiting, we were somewhat weary after nearly a week of sleeping on the floor in a car park with no showers and the only available toilets being blocked up holes in the ground. However, this week gave us opportunity to adjust the brakes and do the various other little jobs around the car. One seriously sketchy ferry ride, a lot of 3am paperwork and several searches later we were in Kazakhstan. I can’t describe how bad the roads were, we were driving on perfect tarmac one minute and then seconds later, there was a white line across the road and that was it. The tarmac was so potholed that the locals drive down the embankments on either side and make their own path through the mud. In the desert heat, the mud, rutted to about a foot or so deep, set like concrete. We were all expecting the suspension to collapse any minute, but it didn’t- the car just kept on going. We had a system- two people stand out the roof and look out for potholes, and they direct the driver. When we eventually broke down, we were on the best roads we’d seen in a couple of days- hard concrete. Then, suddenly, there was a bang and the car would no longer move. 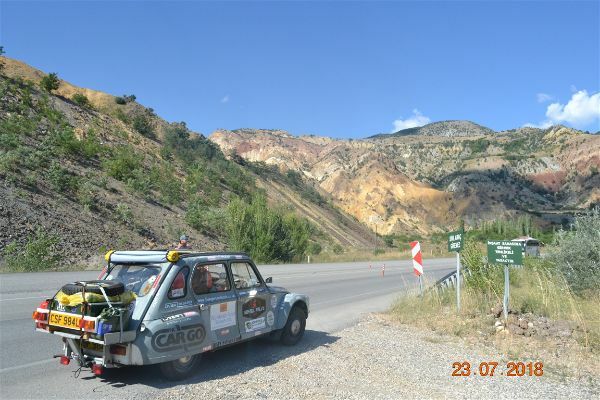 We had driven off the end of the concrete into very fine dust about a foot deep, which wrenched the steering all the way round to one side, and the CV joint on the outer end of the driveshaft had exploded. We eventually got a tow behind a Land Cruiser to the nearest small settlement and they let us use their phone to arrange a tow truck to Aktobe. The tow truck ride was possibly the worst 8 hours of the trip- there was only 1 spare seat in the truck, so 2 of us had to ride in the car- we felt every bump twice, once when the truck hit the bump, then again as the suspension on the Citroen bottomed out. Apparently riding in the car isn’t legal in Kazakhstan, so the driver kept pulling over and running around the back of the car, shouting at us to keep our heads down. We eventually made in to the Hotel Asia in Aktobe, who let us park the car in their car park as we waited a week and a half for the parts we needed to be shipped from Prague and go through Kazakh customs. During the wait, we mended the exhaust, which had been ruined in the unloading process, with a bit of help from the hotel’s janitor and his angle grinder. The new parts arrived, we fitted them, and we were on the road again. Because we’d been waiting so long, we had to turn around- we didn’t have long enough left on our Russian visas to get to Mongolia and back. So, we headed for Moscow, and then the Latvian border. 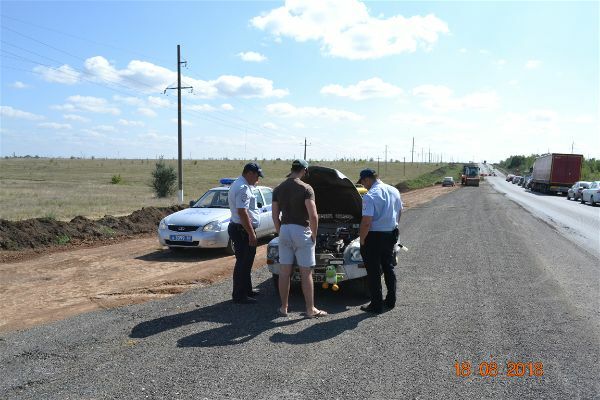 As we drove through Russia, we were getting stopped by the police 2 or 3 times a day simply out of interest- some of them just wanted to take photos, and one policeman even signed the car. When we got to the Latvian border, we were asked for our temporary import document. We had not been given this, and so we couldn’t leave the country- the border guards wanted us to drive back to the Kazakhstan-Russia border crossing where we’d entered the country and get the document. We weren’t about to drive back to Kazakhstan, so we just waited about at the border- after an hour or so, a man with a larger hat than the guard we’d been talking to came out and told her to rewrite the paperwork so we could leave. We drove back across Europe, to Calais, the ferry, and then home. 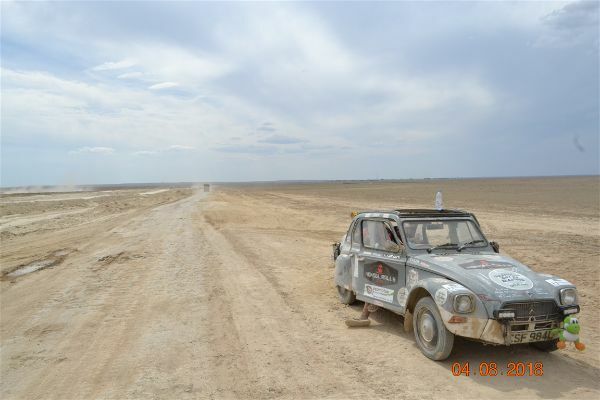 Throughout the trip, the car performed far beyond all our expectations- many people never expected us to make it to Dover, let alone Kazakhstan. I’d like to thank all the people who helped us out- the people who helped us procure parts, who let us sleep in their homes, and made us feel welcome. But also, our sponsors- all our family and friends who helped us out with a bit of cash to get us on the way, and the various companies who helped by supplying us with parts. Here, I’d particularly like to thank Longstone Tyres once again for providing us with such brilliant tyres- even in Kazakhstan, on those terrible roads, we never got a single puncture. We will be attempting the rally again, probably in summer 2020, so follow us on our Instagram @bangersanddash for updates whenever we make some progress. Any support for that would be much appreciated, so please visit www.bangersanddash.co.uk to get in contact.